Having fallen in love with the Scottish leagues with Falkirk I’ve decided to attempt to take Edinburgh City to the Scottish Premier League and the Champions League. So here it goes. Having had a successful pre-season the draw for the Betfred Cup Group Stages took place. We managed to find ourselves in a difficult looking group including Scottish Premier League team Motherwell. 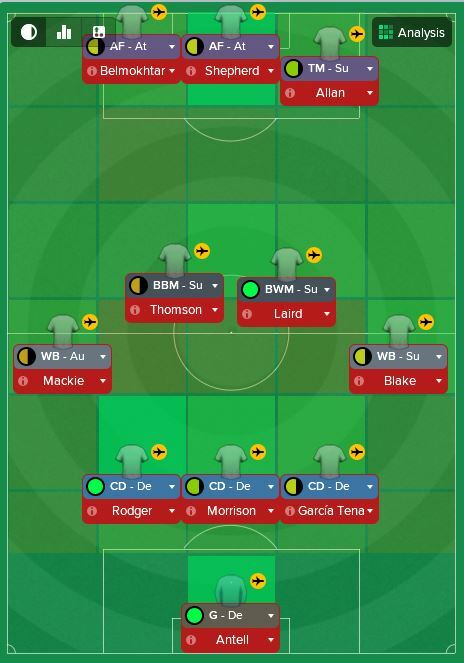 Having decided to go with the preseason tactic, I find myself using wing-backs for the first time. I’m not overly confident with the new player roles so I’m sticking with what I know for now. Before the start of the Betfred Cup, the draw for the Irn-Bru Cup took place. A hopeful looking tie against Hamilton Under 20’s will hopefully see us progress into the next round of the competition. Although the league is my priority the Irn-Bru Cup could be an easy route to a trophy in my first season here. The start of the Betfred Cup took us to Motherwell. A spirited 4-2 defeat against a team of Motherwell’s stature pleased me. Goals from summer signings Ricardo Kessels and Scott Shepherd gave us something to build on in the other games in the group. A 95th-minute winner against Montrose insured my first win as Edinburgh City boss, a closer game than I would have liked against a team considered my equal in this division. We somehow managed to throw away a comfortable 2-0 lead in the last 5 minutes of normal time. We seem to be having some serious defensive frailties. The defensive frailties continued against Dumbarton, a 3-2 defeat against another strong team would normally not have been too disheartening but after being 2-0 up at halftime it was a difficult result to take. The final group game was a tie against Airdrie, a boring 0-0 draw with us taking the 2 points from a penalty win. A fairly average performance all round, although it was pleasing to see my defenders managing a clean sheet. First up in August was the Irn-Bru Cup game against Hamilton Under 20’s. As mentioned before, this is a competition I hoped may provide our first piece of silverware with Edinburgh City. Unfortunately for us, and more importantly Gareth Rodger, an 88th-minute own goal put us out of the cup 1-0. Bitterly disappointed doesn’t even come close. Time to focus on the league and avoiding a relegation fight. Avoiding relegation from this league has to be the priority, so being dumped out of the competition by Hamilton Under 20’s may have been slightly embarrassing but it means I have one less competition to worry about. Next year we will return to the competition and hopefully be more successful. First up were Montrose, all be it this time in the league. A story of two hat tricks followed. A 4-3 victory including a hat trick from youngster Ryan Day. A great start to the season. It still leaves me questioning my defence. We quickly need reinforcing in the centre-back position. The next outing was a tricky away day to Cowdenbeath – another 4-3 win and another hat-trick from Ryan Day. The Edinburgh City academy product seems to have found his scoring boots from an unfamiliar position. Another away day, this time at Stirling, led to our first defeat of the season. We fell apart in the 85th minute after a hard-fought game and left with no points. Disappointing to concede so late after holding on for the majority of the game. The 2-1 defeat was a real kick in the teeth. The last game of August saw us take on Elgin City back at Ainslie Park, a boring 0-0 draw saw us end the month with a respectable points total of 7 from 12. Not too bad for a team tipped for relegation. A clean sheet was greatly appreciated as we seemed to have been leaking goals for fun. In regards to transfers, we currently don’t have the luxury to target high potential youngsters. Of the transfers we have made, most have been made out of necessity. We had no players leave during the summer, and although this would have freed up some much-needed wage allocation I am not too concerned about the financial aspects of the club at present. The players featured below will all be playing some part in the season ahead, we will be looking at 3 players in this post. They are: Ricardo Kessels, Ryan Day and Fraser Morton. Ricardo Kessels is a Dutch youngster who arrived at Ainslie Park on a free transfer after being released from Berwick. He has so far scored 2 goals in 4 games – all in the Betfred Cup. The Edinburgh born youngster Ryan Day is one of the most exciting players to have come through the academy. A blistering start to this youngsters career has seen him score 6 goals in 4 games in August. Another Edinburgh born youngster, this time in the form of a young goalkeeper. He currently has had no first team game time as he’s struggled for fitness. Hopefully, he will be ready for first-team action soon. So this concludes this part of the blog, in the next installment we will be going through from September to January. We’ll be looking at significant goings-on in and around Ainslie Park. Thanks for reading! This series is written by Joe and is his first series on VivaLaVidaFM, so do leave some comments below if you have any advice! And be sure to follow Joe through his Twitter linked here. This entry was posted in Edinburgh City | @LittleJoe54321, FM18 Stories, Football Manager 2018 and tagged Edinburgh City | @LittleJoe54321, fm stories, fm18, football manager, scotland, scottish league two. Bookmark the permalink.